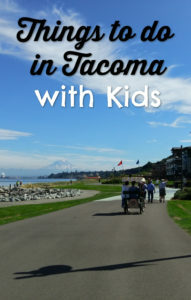 Tacoma is an ideal city for families looking for things to do with kids – it’s large enough to have lots to do, getting around is easy and usually traffic-less, parking is usually free or at least cheap, and there’s a bit of everything. Whether you’ve got a toddler that needs to get out of the house or older kids who need something to enrich their brains, here are our favorite things to do in Tacoma. Bonus – most of them are still pretty fun even without kids. Any day of the year, Tacoma’s park are fun for families. The city’s largest park is Point Defiance, which is home to the zoo, a beach, Five Mile Drive (which is a bit long for most kids to walk as it’s literally five miles), as well as lots of space to explore and roam. Wright Park has a duck pond (though, be aware you can no longer feed any animals in Tacoma’s parks or you risk a fine) and a glass conservatory you can walk through. Charlotte’s Blueberry Park is quite literally a park filled with hundreds of blueberry bushes where you can pick blueberries to your heart’s content for free. And just about all parks have some kind of playground for kids to play their energy out on. Tacoma is known for its museums. While museums might not appeal to all kids, all of Tacoma’s museums have activities for kids somewhere inside. Try making artsy crafts at the Museum of Glass or Tacoma Art Museum, explore car racing or other hands-on motorhead activities at LeMay – America’s Car Museum, or enjoy tons of hands-on exhibits at the Washington State History Museum. Tacoma’s Metro Parks has two public pools that go above and beyond what you’d expect from your every day run-of-the-mill public pool. Kandle Pool (5302 N 26th Street) is Tacoma’s only wave pool and it also has a spray ground within the same fenced area as the pool. Stewart Heights Pool (5715 Reginald Gutierrez Lane) has a water slide, a lazy river, bubble pool (I don’t even know what a bubble pool is, but it sounds fun! ), and more watery play options. Both pools do have an admission fee, and they’re worth it. This children’s museum is just the right size for younger children. While the website says that babies are welcome, your child will really start to get something out of this place once they can walk and explore. Splash in an elaborate water table, climb on various playscapes, or enjoy some hands-on activities. This is essentially an awesome indoor playground where kids can play to learn. The Tot Lot is designed for kids ages 1 through 6 and it’s hands down the best playground in the area for small children. There are walker toys galore for little ones to cruise around the paved sidewalk that loops around the playground. The playground is fenced too so little runners can’t make a break for it. You’ll also find a sandbox, picnic tables, restrooms, and some grassy open space to run around. 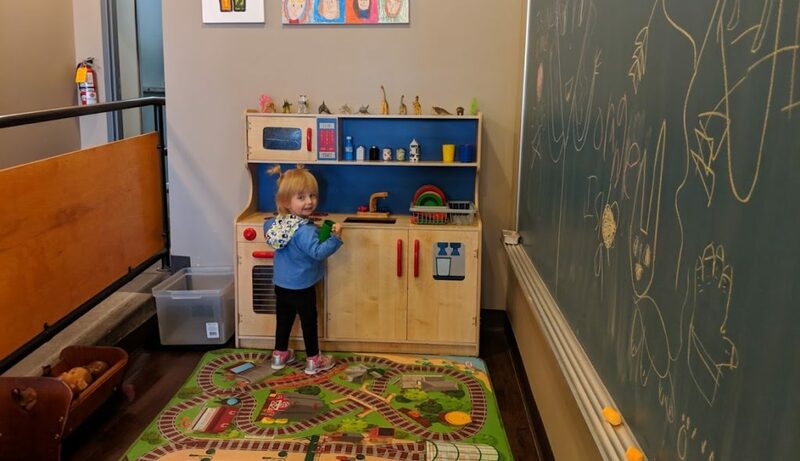 Discovery Village is an indoor learning center and playspace that opens its doors to the public during set hours for playtime (it’s also a preschool and closed to the public during preschool hours). Toddlers and young children can run and play on the indoor playscape, play with Duplo blocks, explore pretend food and a pretend grocery store, or relax in the reading area. There’s even a café so parents or grandparents can grab some caffeine and a snack. The play area at Red Elm Cafe is big enough for a few kids to escape the boring grown-up conversation at the table. If you just need a place to chill for a bit while your kid has a modest area to play in, then this is your spot. This cute little neighborhood cafe serves yummy food and drinks, and has a little playroom for the tots. In warmer weather, many of Tacoma’s playgrounds feature spraygrounds – play areas that feature lots of water features and spray toys, but don’t involve actually getting in a pool. These are a hit with kids of all ages. The Puget Sound is not exactly known as a swimming destination. It’s freaking cold. But that doesn’t mean kids don’t enjoy splashing in the water. There are a few beaches around Tacoma. 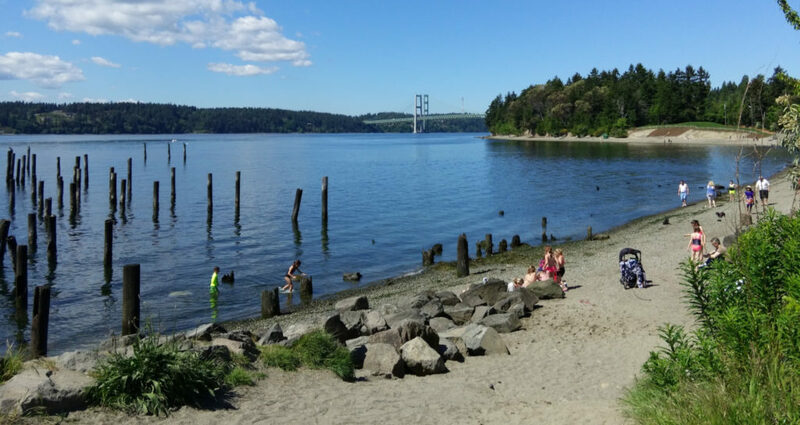 Owen Beach at Point Defiance is one of the most popular, and it has kayak rentals, a snack shack, picnic shelters and a boardwalk. 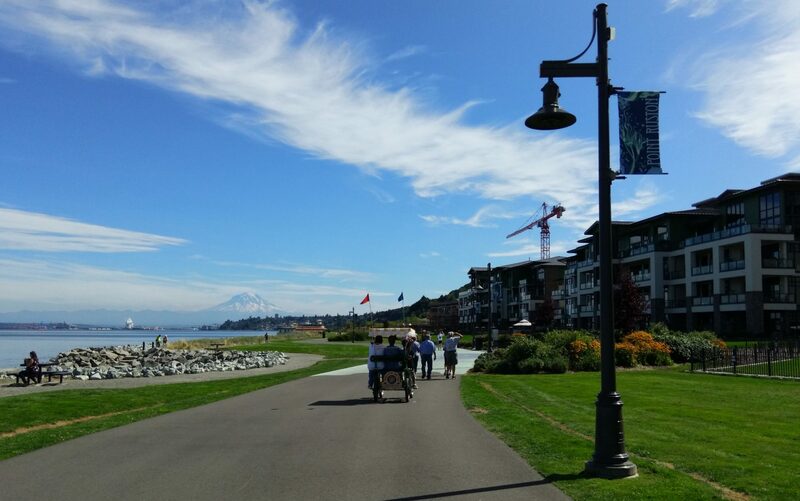 Jack Hyde Park on the Ruston Way Waterfront is another great option as it has a sandy beach. Bonus, Jack Hyde Park is close to the Spar on N 30th and McCarver where you can enjoy some giant cookies in the café half of the restaurant. Titlow Beach on the west side of Tacoma is rocky, but an amazing place to go tidepooling. Titlow Beach is a rocky beach, but an excellent place to peep under rocks for periwinkles, tiny crabs, and other critters. Tacoma’s zoo is just the right size to explore with kids. Say hi to some tigers, elephants, lots of Northwest animals, as well as two impressive aquariums. The newest, the Pacific Seas Aquarium, is home to sea turtles and hammerhead sharks. There are also two playgrounds on the zoo grounds, a carousel (which has a modest fee), and a snack bar. Fort Nisqually is a living history museum that’s perfect for kids. Learn about life in the 1850s from volunteers dressed in period clothing. Kids can see crafts and trades of the past up close and personal. Also keep an eye out for special events as it has things like candlelight tours in October or special holiday decor in December. If you have kids, you might not want to head out into the wilds, but you might still want to explore some nature. State parks are perfect for that. Dash Point State Park is just a few miles north of Tacoma, but feels a world away. You will need a Discover Pass – either an annual or a day pass, which you can buy right at the park. Dash Point has a beach, trails, and even campsites if you want some approachable camping! Point Ruston’s fountain has jets of water kids can dodge or play in during warmer months (and in colder months, a tented ice skating rink usually opens here). The Ruston Way Waterfront stretches along just about the entire north-facing side of Tacoma. Along its span, you’ll find everything from the Chinese Reconciliation Park and Jack Hyde Park, to all kinds of patches of grass and shorelines to explore. Take a break from strolling the paved pathway to look into tidepools or throw some rocks into the water. There are several restaurants dotting the way as well. At the far northern tip is Point Ruston, where there’s a playground, more restaurants and shops, a fountain that kids can play in during warmer weather, and wheeled vehicles to rent too. Tacoma Nature Center offers a little bit of everything nature right in the heart of town. First and foremost, the Center is home to some very approachable trails where kids can spot turtles in a pond or watch for birds and other wildlife. The trails aren’t paved, but are fairly flat (still, leave that umbrella stroller in the car). There’s also a playground with lots of logs to climb over and through, a tree house, slides and other fun. Just what it sounds like, Debbie Doolittle’s is pretty much a little kid’s heaven. Learn about and interact with animals that range from wallabies to rabbits, mini pigs to goats, llamas to mini horses to capybaras. Pony rides are also available and sometimes the ponies are even decked out like unicorns.